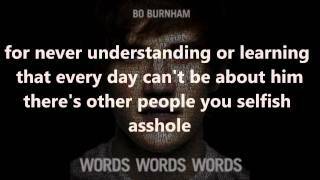 For everyone here who thinks this is not Bo Burnham, or that that the song is deep and meaningful, I'd just like to point out HE'S A COMEDIAN. He writes songs to make fun of things... like artists. This is trite, pretentious and inane. It's also an exercise in bad faith. Look all that up, then listen to this song in 10 years. If you still think it's great, sorry to say, you're a lost cause.